Trinity Palacio, T.C. Williams–Palacio, who has seemingly been around forever, had another great season leading the Titans. The guard uses her quickness to dominate opponents on offense and defense but is underrated in several facets of her game. Despite her relatively small size she is always a factor on the boards and she is tough and intelligent. So many times opposing coaches came into games with a game plan to limit Palacio, only to find they had to give her even more attention to have a chance. Whatever school signs this one is going to get a steal. Akunna Konkwo, Bishop Ireton–What more can you say about the region’s most dominant center? If you go see an Ireton game, an off night from Konkwo still means like 16 points and nine rebounds. This despite playing in the WCAC with extra defensive attention constantly thrown her way. Only failed to reach double-digits in rebounding twice the entire season. Scary part is she should continue to get better and if her free throw percentage continues to improve her scoring average will be mind-boggling. Unsurprisingly has DI offers all over the country. 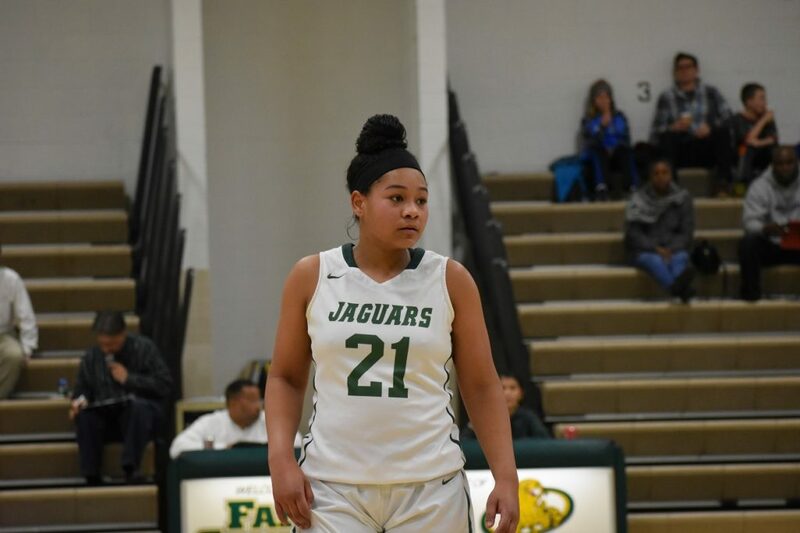 Jaelyn Batts, Freedom-South Riding–Athletic, long forward got even better in 2017-2018. Her jump shot improved by leaps and bounds and her range and free throw shooting got better as well. Batts’ half-court scoring ability and footwork continues to get better, but she also excels in transition when the Eagles get out and run. She’s always a threat to block a shot from the weak side to boot. Hard worker will take her talents to Albany to play for the Great Danes in 2019-2020. Carole Miller, Edison–Expect Edison and Freedom to tangle next year, perhaps multiple times, as they did this year. That game(s) will be must-see TV, in no small part because of Batts and this one, Carole Miller. Division I scouts spent a lot of time in Springfield this year to check out Miller, who took another step forward this season. 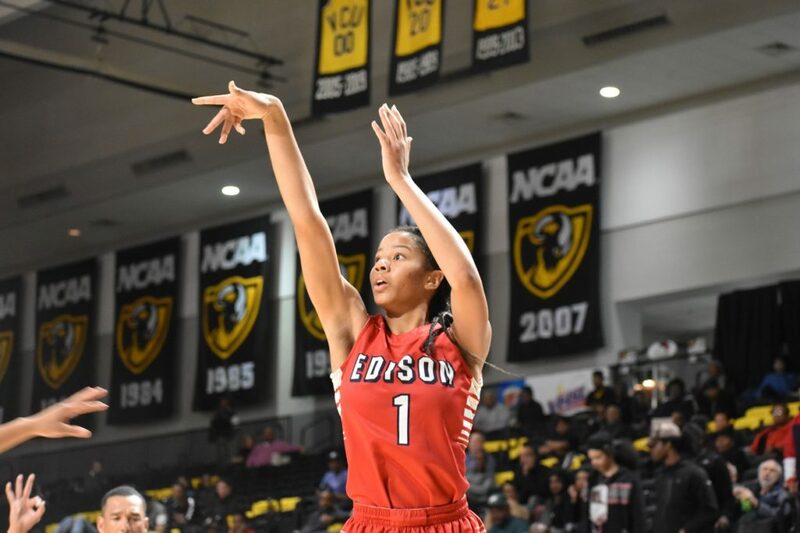 The small forward/big guard excelled on defense and in transition, and her ability to dominate on the boards allowed Edison to play small and fast. Needs only to continue to improve her shooting to take her from very difficult to stop to almost impossible. Edison’s Carole Miller strokes a jumper in the state final. Ashley Owusu, Paul VI–We literally keep forgetting this one is only a junior. Kind of a point forward in the truest sense, Owusu can control the ball on the perimeter or do dirty work inside as she sees fit. Strong and athletic, Owusu was absolutely dominant at times. Failed to score in double figures only twice on the year, once essentially because she was pulled early in a blowout win. Scored 39 points against a very solid team from New Jersey. Committed to Maryland. Shay Hagans, Osbourn Park–Don’t be fooled by this one being second team. The OP guard is a first team talent all the way, in this spot only because of the incredible talent in this area. Hagans was very good as a sophomore but clearly even better this year as the undisputed leader of the young Yellow Jackets. She gained physical strength and maturity, handling opposing defenses’ focus with smarts. What more can we say about the JMU signee? She can shoot, run the floor and pick anyone’s pockets. She’s really, really good and will be a big factor in the CAA. Liz Shean, Yorktown–Yorktown didn’t have a great season in the tough Liberty, but the Patriots could beat anyone on a given night. 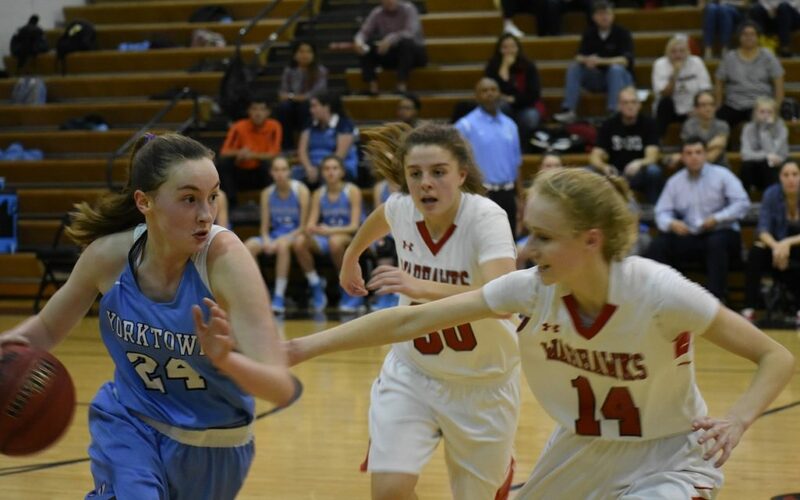 That’s because of this one and fellow junior Maggie Shipley, who together probably legitimately accounted for 75%-85% of Yorktown’s scoring output. Shean is a guard who can flat out score. She is deadly from long range, but also has a fantastic ability to get defenders off balance and get to the line by attacking the hoop. Scored 33 of her team’s 47 points in a loss to T.C. Williams. Again scored 33 in a February win over McLean, going a perfect 12 of 12 from the line. Yorktown’s Liz Shean (left) drives against Madison in the regional playoffs. Sara Park, The Potomac School–TPS doesn’t have the depth of most public schools or even some of their league private school rivals like Episcopal and Flint Hill, but that matters little when you have a talent like Park (and fellow guard Courtlynne Caskin). Park can handle the point and is a nifty ball-handler, but she can also play off the ball as well and plays strong fundamental defense. Averaged almost 18 points a game with an average of over two made threes per contest. Molly Sharman, West Springfield–Led the Liberty District regular season co-champs and tournament champs in scoring for the second consecutive year. Right at home in a grind-it-out half-court game as a tough guard. She’s able to still score in that sort of game while still giving her all on the boards and on defense. Capable of attacking the rim in a number of ways. Needs only to improve her consistency and shooting to take things to the next level. 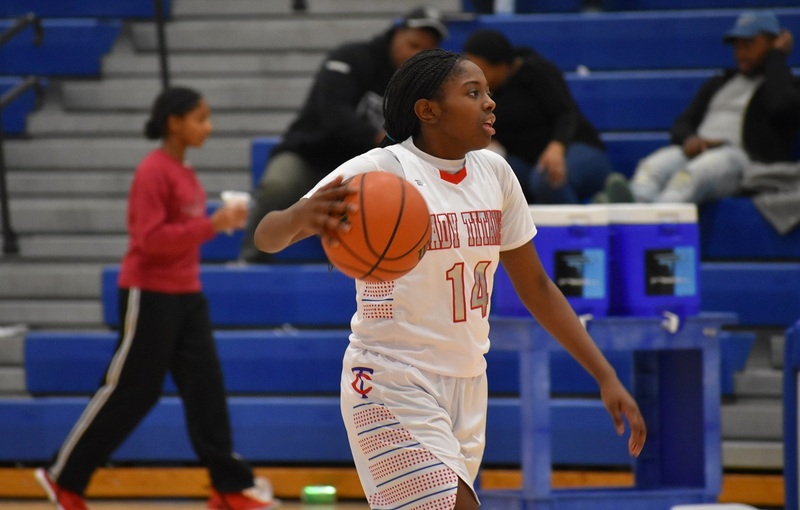 Sarah Shamdeen, Annandale–Atoms had another tough season but Shamdeen continued to do her thing, teaming with fellow junior guard Jayla Irvin to form a dangerous duo. She is a fantastic shooter and can handle the ball extremely well. Burned Hayfield for 30 points and Mount Vernon for 27 but is also adept at driving and dishing. Despite rarely getting a rest almost always displays a strong motor and has her head in the game. Sasha Bates, T.C. Williams–Known primarily for her defense, the three-year starter actually makes an impact in a number of ways for the Titans. She loves to stop and pop, and can do so accurately from mid-range. She can hit from the arc and handle the ball as well. But yes, opponents fear Bates mostly for her defense. She is constantly in the passing lanes and picking opponents’ pockets directly, and opponents must be wary of that at all times. Like Palacio often makes an impact on the boards as well. T.C.’s Sasha Bates is known for her defense, but she brings other skills to the table. Haley Pasqualone, Loudoun Valley–Hey, speaking of defense, let’s talk about Haley Pasqualone. If you’re throwing bad passes around against the Vikings, there’s a pretty good chance she’ll make you pay. Great at getting in the passing lanes and suckering opponents into trying to get passes through and over her, Pasqualone is a defensive whiz. Oh, she can score too. She’s a double-digit scorer with a sure stroke from three-point range and sound fundamentals across the board. Maggie Shipley, Yorktown–The other half of the Yorktown duo is dangerous in different ways from Shean. She’s a tall guard-forward who can handle the ball very well, going between her legs and attacking the hoop with just a few long strides. Not as much of a shooter as Shean but more than capable of drilling the trey, Shipley averaged well into double figures on the year. Her length and solid footwork make her an intriguing next level prospect. 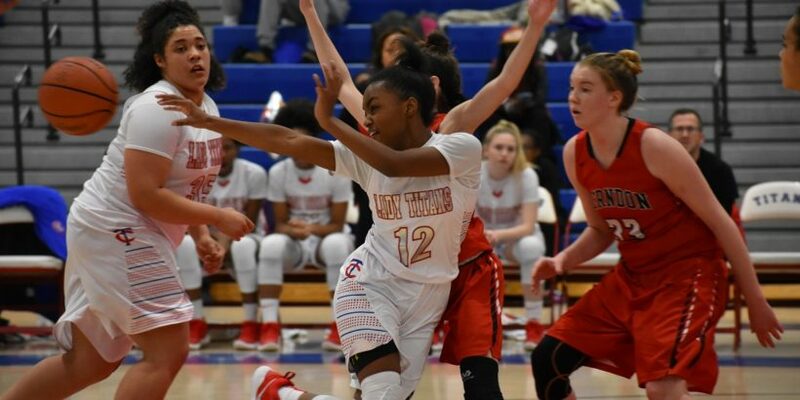 Sierra Kennard, Falls Church–The National District is incredibly strong in the class of 2019, with talents like Mallory Brodnik and Savannah Wilson of TJ, as well as Hannah Foley of Wakefield all grabbing strong consideration for these teams. Kennard makes it after a very good season leading the underrated Jags in scoring at about 14 a game. She’s a good three-point shooting wing with size, capable of dominating on the boards as well. Produced a bunch of double-doubles on the year, most crucially in playoff wins over Wakefield and Stone Bridge. Falls Church’s Sierra Kennard is a dangerous shooter and underrated talent. Claire Miller, Flint Hill–Have to mention teammate Whitney Wiley here as well as Kailyn Shepherd of Episcopal, both fantastic ISL players considered for the team, but we’re giving this spot to Miller. The bruising, technically sound forward always makes her presence felt down low for the Huskies, doing a lot of dirty work. She’s a great finesse player as well, like most of the Huskies always striving to take the optimum shot. Scored 22 points in a win over Sidwell Friends including four three-pointers, but usually doesn’t erupt on offense. Very consistent though, going for double-digits on most nights.